Elliot is a character that for some us is near and dear to our hearts. 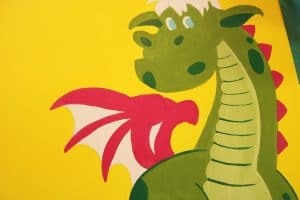 With the new version of the movie coming out, this Pete's Dragon canvas painting tutorial is the perfect way to share that fondness with our kids and maybe even open up a door to let them watch the older version too, if they never have. 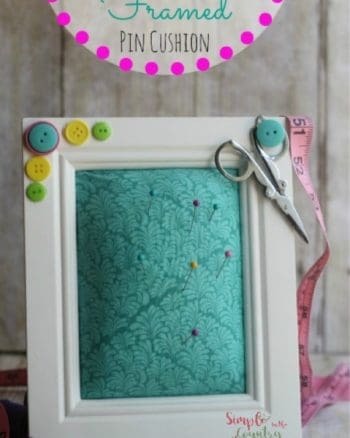 You will need a printer to print out the tracing pattern in the photos. Just save the photo to your computer and print it in a standard size. 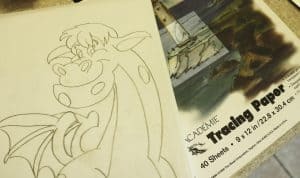 Then you will use it to trace and transfer on to the canvas, unless you like to draw, and then you can just copy it and sketch it on yourself. 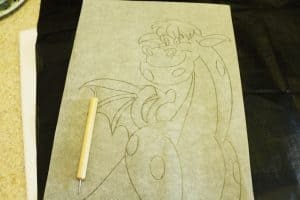 First thing you need to do is to print the photo of the tracing pattern on to a standard size piece of paper, and then, use a sheet of tracing paper, laid over the tracing pattern and trace it. Once you have that done, use the carbon transfer paper underneath, between the canvas and the tracing paper. 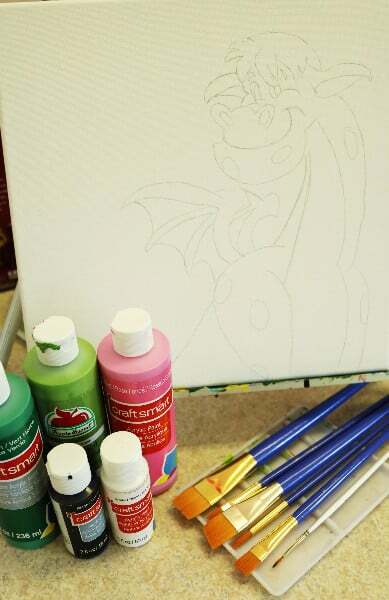 Be sure to line up the bottom of the dragon very close to the bottom right corner of your canvas, and also be sure the transfer paper is under there all the way. You can either tape it down in one corner, or you can tuck the paper under to help keep it in place. I typically don’t use tape because I want to keep reusing the carbon paper and don’t want to risk tearing it. I hold one hand on the papers so they don’t slip and trace with the other. Now, go ahead and use either the tracing tool, or your pencil and go over each line, transferring it on to the canvas. Pull up the paper once in a while to make sure you didn’t miss any lines. Once it’s transferred, you can get all your paints and brushes ready and begin painting. 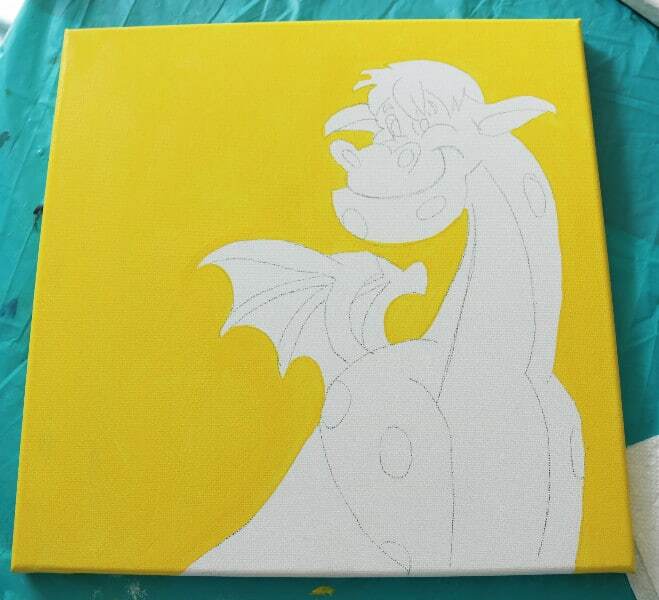 First thing you will paint is the yellow background, (unless you chose another color for it.) 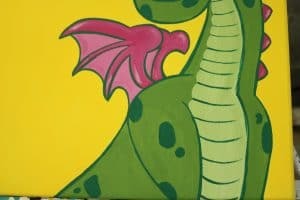 Use a very thin brush first to outline the dragon and go between any small areas, and then go back in with a larger one to fill up the rest of the background. Be sure to also paint all the way around the canvas edges. I leave the bottom edge until last, turning the canvas upside down on the easel, so it can have time to dry. Paint Elliot’s eyes white, using a thin tiny brush, and the rinse the brush for the next part. Next to paint is Elliot’s greens. First, using the same thin brush, outline him in the light green in any of the parts of his body that are that color, and also leave some empty spots on him in a random pattern to fill in with the dark green afterwards. 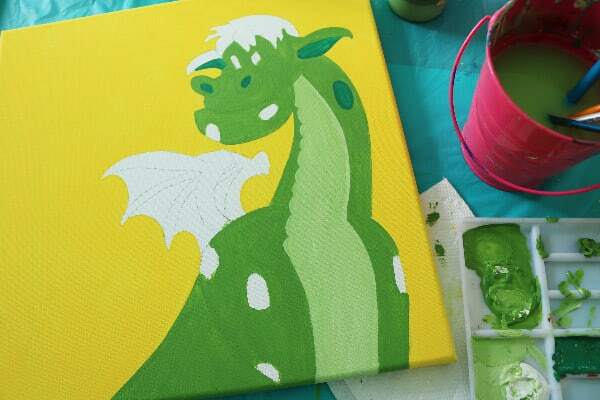 Then use the dark green to paint in the small areas of spots wherever you choose, and inside his nostrils and ears. Now, take a little of your white paint and mix it in to the light green in a separate section on your palette. This will be the color for the center of his body. Go ahead and paint that in next. Now, using the smallest, tiny brush you have, you will need to make thin lines going down that section in fairly even intervals. As it gets closer to the bottom, where his belly is, you can make them a little further apart. One trick to getting a nice, thin line is to be sure your brush is a little wet first. It will help the paint flow easier. Hold the brush more like you would a pencil and practice on a paper first if you’d like to to get the hang of it. After you get those lines in, start outlining his body, around his arms and neck. Now we will move on to the pinks for a bit and come back to the green later. 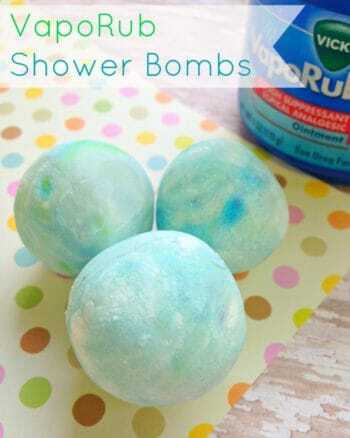 Be sure to rinse your brushes well so no green mixed with the pinks. Now you are going to make small triangular shapes down his back, see the photo if need be. They need to be close to the same size and evenly spaced. 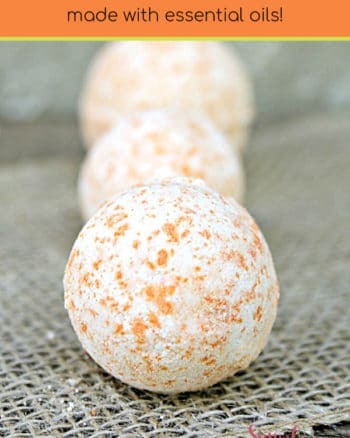 Use the darker pink for these and use the very small brush to form the outside of them before filling them in with paint. Next, outline his wings, all parts of them, except for the places between the ribs. Those will be light pink. Once you have both pinks on the wings, do a little highlighting on the edges of the wings to give them a little dimension. Use the light pink and a touch of white on the curved parts of the wings and a little bit on the lighter pink area in the darker pink as well. This helps it not look as flat. Now, paint his hair light pink, and then using your tiny brush, add some random light strokes in it, using the dark pink to make it look more real and have some depth. You can also go ahead now and paint him some blue in the eyes. They should be off to the right and about 2/3 of the space. Last thing you need to do is to outline the rest of Elliot’s body. Use the smallest brush, and just as you did the lines on his tummy and his arms and neck, go ahead and form the rest of the outline. Also, make his smile at the same time. I did 2 lines to make it wider than the rest of the outline so it would stand out more. Make sure to get his nostrils shaped well and the area right over them. It has a few small lines to help form the snout. Put a few really light lines of green in the hair also. Now, just check over the painting and see if there are any areas that need to be cleaned up or touched up and go ahead and do that. 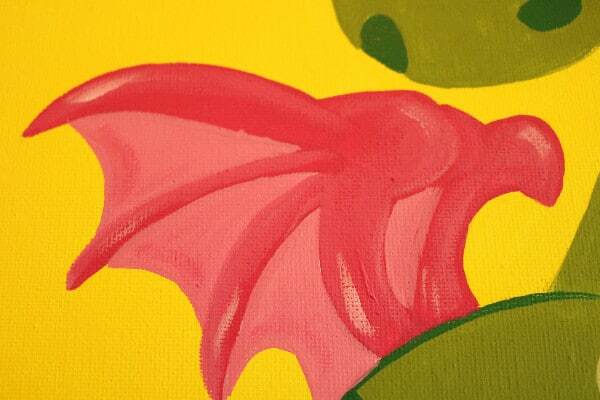 Once you feel it’s done, flip the canvas over and paint the bottom edge. Let it dry or blow dry on a low setting if you are needing to be quick with it. 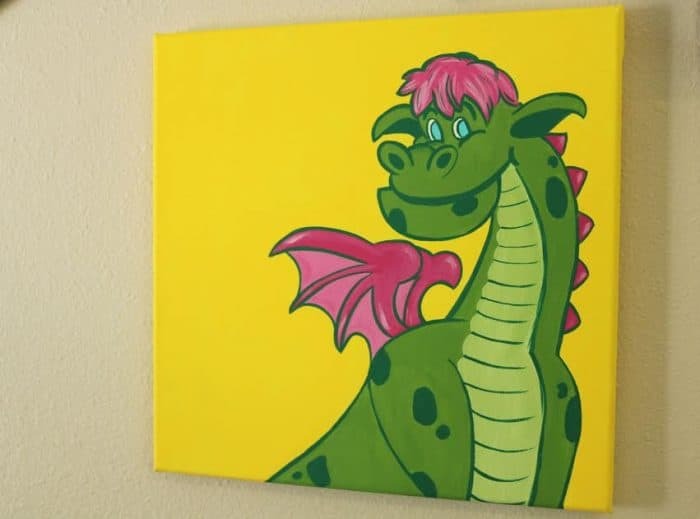 Now that you have read the Pete's Dragon canvas painting tutorial you are ready to create your very own Elliot canvas painting.